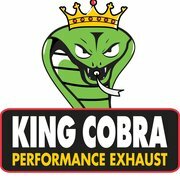 Mufflers and Custom Exhaust: King Cobra Performance! Today, more and more customers are coming in because they want to put a custom exhaust system on their vehicle. They want it to look and sound unique.We are your source for performance and replacement mufflers. We can meet any specification and install mufflers on any vehicle. Your vehicle is an extension of you. Let us fabricate the perfect exhaust system for you! We carry the biggest brands out there. Magnaflow, Cherry Bomb, Flowmaster, Super Chips, intakes, stainless steel and chrome tips. Your vehicle will look and sound powerful!